When it comes to Tegra 2-powered Android tablets, the Notion Ink Adam, the Viewsonic G, and Motorola's upcoming Honeycomb tablet are all the rage, but a small company called Stream TV would like to remind you that it's got a dual-core tablet of its own. Indeed, Stream TV is now shipping its eLocity A7 tablet, complete with a 7-inch display, Android 2.2 Froyo, and of course, the aforementioned nVidia Tegra 2 processor. For now, the company is only shipping it to those who pre-ordered it back in September, though Walmart, NewEgg, BJs, and Tiger Direct should be carrying the device for about $399 shortly, while Amazon will soon be touting it for just $369. Not a bad deal, I must admit. 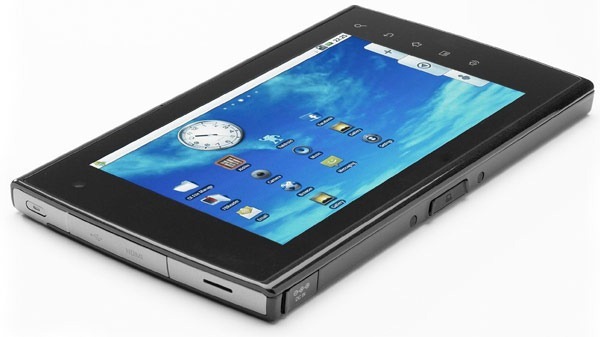 PHILADELPHIA, Dec. 13, 2010 /PRNewswire/ -- The eLocity A7 seven-inch Tegra 2 mobile tablet running Android 2.2 Froyo begins shipping to pre-order customers today and will be available for purchase through various retailers this week, Stream TV Networks announced. The eLocity A7 will be available for purchase beginning this week at http://Sears.com, http://Newegg.com, http://Walmart.com, http://BJs.com, http://TigerDirect.com, http://Amazon.com and http://MicroCenter.com. CEO Mathu Rajan of Stream TV comments, "We're confident that the A7 will provide a great mobile computing user experience. We worked very hard on the UI and software in recent months to ensure that we were integrating the newest and best solutions, but also met the added challenge of doubling original production targets due to high demand. We know that our customers have been eagerly anticipating this release and we look forward to receiving their feedback." The A7 optimizes portability, connectivity, and computing power like never before in one sleek device. The first mobile tablet available in the U.S. running Android 2.2 Froyo, the eLocity A7 offers a wide range of mobile apps, supports Adobe Flash and is enabled for 3D gaming with the NVIDIA Tegra T-250 dual core processor. Sporting a high resolution seven-inch capacitive and multi-touch screen, 4GB of high speed internal flash memory, the eLocity A7 is a multipurpose device that provides a full entertainment solution along with business productivity and wireless connectivity. The tablet is equipped with a micro SD slot supporting up to 32GB of added storage, a USB port supporting up to 64GB of added storage and a 1080p HDMI output. With streamlined dimensions of 8.2 inches by 4.8 inches and weighing just over a pound, the new eLocity A7 tablet is more portable than the iPad and sports a striking design expected to appeal to a wide demographic of users. The introduction of the eLocity A7 tablet is the first step in Stream TV's strategic growth plan to bring to market innovative products featuring state-of-the-art technology designed to transform consumer communications and digital lifestyle. Stream TV Networks, Inc. is a Philadelphia-based new media company founded in 2009 to serve a consumer market seeking enhanced entertainment and communications experiences through superior quality devices with unlimited accessibility and superior quality. Through its eLocity brand, Stream TV intends to reshape the current media landscape by releasing computer-enabled devices that create an environment where on-demand access to content is available anytime and anywhere, where interactive user feedback is standard, and where creative participation and community formation around media content is nurtured. The company's mission is simple: redefine "new media" so that it reaches its true dynamic potential and real-time interactive relationship with the media consumer. For more information, please visit http://elocitynow.com.